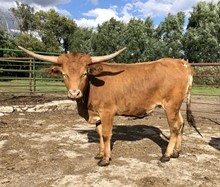 Main herd sire at the ranch. His breeding is impeccable. The 2017 calf crop has been very pleasing. Large bodied calves, with lots of colors. We are so thankful & blessed to have this bull. 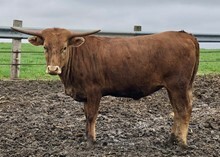 His total horn at 83.475 for a three year old, weighing in at nearly 2000 lbs. is stunning.